This herb butter is so good you'll want to lick the spoon. We offered a similar compound butter for a cedar planked halibut recipe, so you might notice a theme - when there's a plank involved I almost always get out the butter. (yum) There's something about that smoky, garlicky, herby flavor combo that I just *love*. 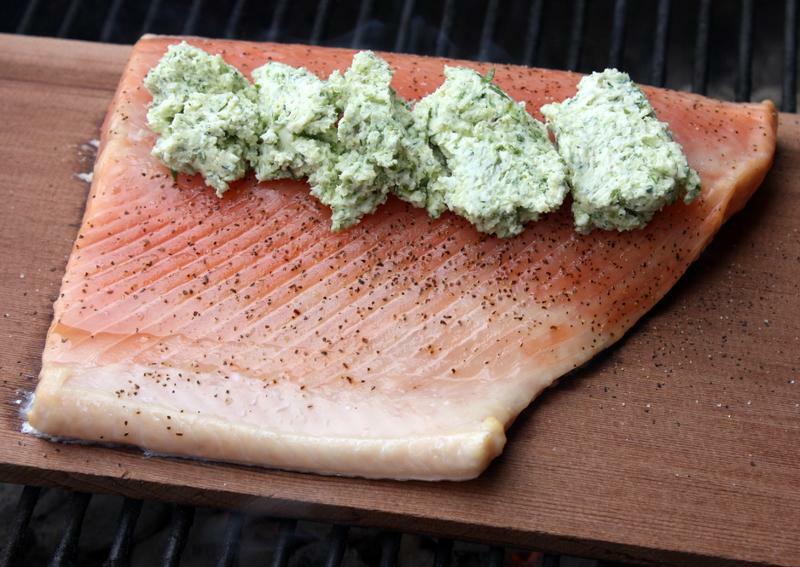 For the salmon you'll want about 6 to 8oz (half a pound or less) per person, and get your hands on a cedar plank. We have them at the shop for $4.50, and if you use it again within a day or two you can usually use them twice depending on how it holds up to your particular grill. Start by soaking your cedar plank. I set mine in a casserole dish and fill it up with water for about an hour. If you're using charcoal - get your grill going! Once your coals are looking good and your plank is happily waterlogged, place the salmon on the plank with the skin side down and salt and pepper the fish. Add a layer of herb butter to the top of the fish and position so that as the butter melts, it will coat the salmon. Set the plank on the grill and position so that it will burn slightly on the bottom but not burst entirely into flames. We're going for a slow smolder so that your fish will take on a fabulously smoky flavor from the burning plank. To accomplish this, put the lid on the grill and vent appropriately - no flames on the fish, but lots of heat and some smoke! Set your timer for about 30 minutes. We're cooking indirectly so it will take much longer to cook than it would if you had it directly on the grill. Check the fish every 5 minutes or so to make sure you don't need to do any adjusting to produce the optimal planking, and that's about it! Once it's done, serve with a crisp green salad and some crusty bread to sop up any 'extra' butter. Enjoy!